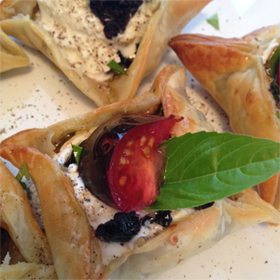 Our savory hand pies are baked and filled with an array of fillings sure to make your tastebuds happy. For the veggie minded, try our purple potato, leek, and Irish Cheddar cheese; or if you prefer a little taste of Morocco, try our lamb, ras al hanout, olives, and mint. Forget everything you know about an empanada. 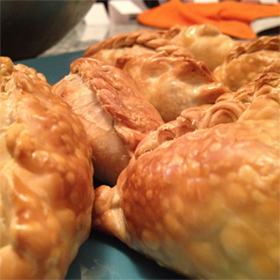 has bequeathed itself the ambassador of the modern day empanada, bringing you an array of savory artisan pouches with fillings as varied as their origins. Using organic seasonal ingredients, free range and grass fed proteins, along with the traditional spices that influence the many cultures they represent. It's a wonderful way to enjoy a little bit goodness. Empanadas have a long history in modern day cuisine, with many laying claim to their origin: some say they originated in the Middle East, others say Muslims brought them over to Spain, and the die hards say empanadas are born in Spain, and that's that. 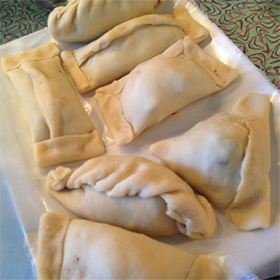 Generally, empanada dough is wheat based, however, the Incan influence runs true in the corn based dough variety. 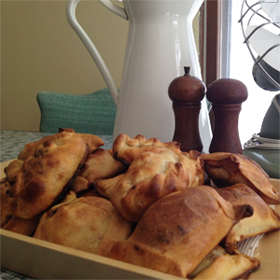 Hand held portable meals, aka pasties, provided sustenance to Cornish miners. Pasties were easy to heat up and the miners would throw away the part of the crust they touched to prevent arsenic contamination. The story continues that the discarded crust fed the ghosts in the mines. Whether you enjoy Cornish Pasties (Tiddy Oggy), Jamaican Patties, Dominican Pastelitos, Spanish and/or Latin American Empanadas, Middle Eastern Samosas, Scottish Bridie, Italian Panzerotti, Tinidad and Tobago’s Aloo Pie, Malaysian Curry Puff, Ashkenazi Jews Knish, a microwavable Hot Pocket, or one of the many we left out, an Empanada is like taking a journey around the world without leaving your neighborhood.